Bifurcation of the status of the marriage (also called “status only dissolution”) is a process that allows the court to grant an early divorce and restore each spouse to their single status, before issues such as spousal and child support, child custody, and property division are decided. In simple terms, bifurcation is an early termination of the marital status, prior to finalization of property division. It is important to note that even if bifurcation of marital status is granted, you cannot obtain a divorce decree less than 6 months from the day the Respondent (the spouse who did not file for divorce) was served. 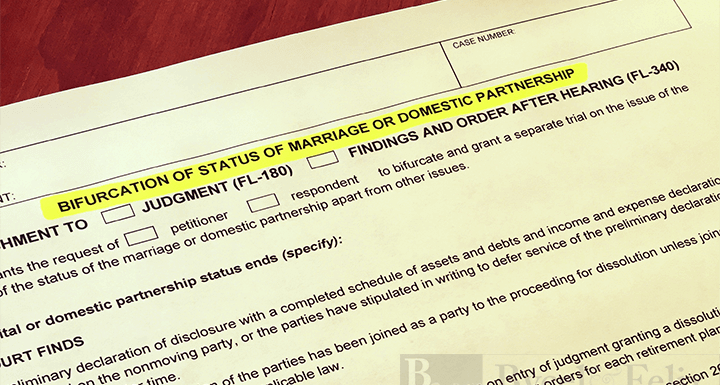 The court requires that each spouse complete and serve the required Preliminary Declaration of Disclosure (aka, PDD) before it can grant a bifurcation. The PDD consists of Income and Expense Declaration and Schedule of Assets and Debts. Alternatively, the parties can stipulate (agree) in writing that the PDD can be served at a later time. Bifurcation of marital status can be accomplished by one of two ways: either through a Request for Order, where one spouse asks the court to grant bifurcation; or through a stipulation – where both parties agree to bifurcate. Women can change their name. Maintain all existing health and medical insurance coverage for the other party and any minor children as named dependents, so long as the party is eligible to do so. Further, if at any time during this period the party is not eligible to maintain that coverage, he or she shall, at his or her sole expense, provide and maintain health and medical insurance coverage that is comparable to the existing coverage. Indemnify and hold the other party harmless from any adverse consequences to the other party if the bifurcation causes the other party to lose (i) the right to a probate homestead in the residence in which the other party resides when the status only bifurcation is granted, and/or (ii) the right to a surviving spouse probate family allowance. Indemnify the other party for any adverse consequences with respect to any retirement, survivor or deferred compensation benefits under any plan. Indemnify the other party for any adverse consequences in connection with special security benefits. Maintain the other party as beneficiary of nonprobate transfer. Before you consider bifurcation, you should discuss the process and the consequences with an experienced family law attorney. Disclaimer: The information provided on our website does not constitute legal advice and is not intended to provide legal advice. The materials provided on our website do not establish an attorney-client relationship.